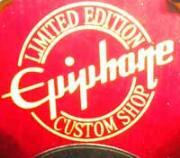 Epiphone LE Electar Century Tube Combo Amplfier I Want One of These When They Come Out! The Ltd. Edition 75th Anniversary Inspired by "1939" Century Amp revives an Art Deco era masterpiece from Epiphone's early days in Manhattan. The amp is a faithful replica of a classic 1930s era cabinet design including bent rims, an all-metal handle, 6-point star screws, and vintage style grill cloth. The redesigned 18 watt electronics include two 6V6 and two 12AX7 tubes, a 12" speaker, a Master Volume with pull "boost" mode, Master tone, Bright, Normal, and Dark inputs, an Extension Speaker Output, Footswitch Jack, and Internal Bias Adjustment. The Inspired by "1939" Century Amp is the kind of amp all guitarists have been waiting for, capable of filling a club or a recording studio. It should be a valve Rectifier - but I doubt it will be. I'll pass then. Jeez I wondered where this thread went. Guess I posted it in the wrong place. Sorry about that. Does anyone know if the output transformer in this amp is multi-tap, ie can it be rewired for 220-240V as well as the standard USA 120V? not sure about the output transformer but there is a 240V for the UK market. Did anyone ever try one of these electar century 1939 amps out? I've read one bad review and I'm looking for a second opinion. sounds a tiny bit "boxy" to my ears as is, still not bad. Through my 2x12 cabinet, it sounds unreal. The attenuator thing is a nice touch. I'm still waiting for the foot switch (on back order from Musicians Friend), Ive had the amp for more than a month . Do I like it ?...heck yes. Try contacting Epiphone customer service, they might ask an engineer and get back to you, maybe...Give it a try at least. I ended up grabbing one of these. It sounded "weird" at first, like the cabinet was loose and rattling (chuffing), but that went away after a couple hours. I don't know: maybe it needed broken in? It sounded like the baffle was loose or something, like an old Fender Champ, but I thought maybe it was designed that way, but it sounds "tight" now, so I don't know. I got it because I've always been a stickler to the all-tube amp sounds, but then I grabbed a tiny little Electro-Harmonix 44 Magnum amp/pedal that blows the Electar away in every way. Haven't touched the Electar since I got this solid-state pedal/amp. I never thought I'd ever be able to stand a SS amp's sound, but I've changed my mind. I use the SS pedal/amp to preserve the tubes on my tube-amps, but it does everything I want, so I'm thinking about getting rid of the tube amps now. I want to add that having the power amp on my pedalboard keeps the unbalanced/shielded instrument cabling run shorter, and having the master volume at my feet is really convenient, especially if the controls are hidden on the bottom/back of a combo like the Electar. The Electar just looks so cool, but that's the wrong reason to buy an amp. It's semi-portable, but the knobs and switches aren't protected by the cabinet enough. If the combo fell on its back, or if something else bumped up against it (on the road), the switches and knobs would get broken off. There isn't enough overhang on the cabinet to protect its controls - so it really needs a road case to be correctly portable, but it's light and small and has a (crooked) handle. I got the Electar for its portability, but this little 44 Magnum lives on my pedalboard, all sealed up and safe/protected during travel, with nothing more to carry - so it's more portable than the Electar with its knobs and switch unprotected, and the Electar's fancy finish is more fragile and likely to show scuff-marks easier too. So the Electar reissue is just going to be my home-practice-amp, but in reality it just sits there looking pretty as I use the 44 Magnum pedal/amp for everything. Besides looking pretty, I guess I could use it for studio recording for those times when "genuine tube toanz" need to be captured, but the difference isn't likely to be noticed. In retrospect, I don't need the Electar Century ReIssue amp, but I still like it. It has its own charm, and I plan on keeping it around. Doesn't take up much space and could be a good candidate for future custom modding. You have to take off the entire rear panel to unplug the internal "Electar" speaker's 1/4" phono plug. Plugging another cable in its "external speaker" jack (parallel wired) and testing the resistance at the end of the cable I just plugged in (with the amp's power off) measured right at 2Ω's resistance. The manual say's the internal speaker is supposed to be 8Ω's and another 8Ω load can be utilized for a stable rating at 4Ω's. Of course, maybe my reading wasn't accurate, since I didn't measure the speaker's terminals directly (too lazy to remove the back panel) and I'm reading the resistance of the jacks, wiring, etc. I did plug in a single 12-inch cabinet rated at 16Ω's parallel in the Electar's external speaker jack (going by the specs that the internal speaker is rated at 8Ω's), and it was happy with that, but I wish there was an easier way to unplug its internal speaker without undoing all those screws. The Magnum 44W pedal/amp seems like a hundred (okay 50W) watt all-tube head. I'm just saying. The Electar 18W all-tube combo is a "practice" amp, and I'm not sure it would be useful near a loud drummer. (I also thought it would be physically larger, being a 12" speaker and all, but it's all housed in a compact cabinet.) The SS pedal/amp could handle any drummer at the loudest of stage volumes. The Electar is more for mellow jazz and bedrooms. You could get away with it being your main rig, but I think you'd live on the verge of needing/wanting more all the time. The Electar begins breaking up at much lower levels than the Magnum 44W. The Magnum 44W breaks up smoother/creamier. The Electar breaks up more raw, raunchy, dirty, grittier. I'm just saying. I purchased one as well. It did sound a bit tight at first but now that I've played it for hours and broken in the speaker better I like it just fine. I have an extensive amp collection and so I don't rely on any one amp but I specifically bought this one for my livingroom. It looks great in there and sounds just fine for my purposes. I have not yet hooked up an external speaker cab because I wanted to get the amp's internal speaker broken in good first. Mine arrived in perfect condition with no issues at all. I'm glad I purchased one. It's detailed in the instructions. It was easy to do, but I couldn't bias the stock tubes "hot" enough. You just hook up your leads set to millivolts and turn the potentiometer. The limited-edition, 75th-anniversary "1939" Century Amp is a modern 18W all-tube, combo with a 12" speaker that revives an Art Deco-era masterpiece.